Heavy snow and blizzard conditions on the drive up to Tulloch on the Saturday meant that very few hills were climbed on the first day of our Hogmanay break. Alastair however lived true to his moto of 'an extra hour in bed is worth 2 on the hill in the dark' as he and Alan completed their grade 1 gully in the Cairngorms at 8pm finally arriving at the hostel at 10pm! However eventually all 24 managed to make it through safe and sound, apart from David who lay at home in his bed with a cold (arhh!). Sunday offered a fair day's winter weather; some snow, some icy wind but not bad views for most of the day. One party (those not inclined to dig out their cars!) set off to do the Munros Stob Coire Sgriodain and Chno Dearg out the back of the hostel and another group did a Corbett out at Glenfinnan. A clutch of other hills were made by other members, with Jonathan and Jo sensibly choosing cross-country skiing rather than wading thigh-deep in snow like the rest of us. Bill B also chose a new winter sport - having driven his car into a ditch, he spent the next 2 hours getting it out on his own using 'Krypton Factor' ingenuity of building up a ramp of small stones. Car and mountaineer were both unharmed, with the latter still gaining a summit before tea and buns back at base. In usual EMC style New Year's dinner was a feast! Mulled wine and assorted snacks made a civilised start to the proceedings. Then a choice of homemade soups, followed by beef casserole or vegetable rissoles with plum sauce. An amazing array of desserts, shortbread and tablet and after dinner mints rounded it off nicely (or finished us off - phew!). Well done to all of the cooks who prepared the food in advance and on the day. Thanks also to Lesley, who prepared this year's quiz, delivered in her famous Ann Robinson-style. After two days of early morning chaos in the kitchen with people preparing for big winter days, January 1st was a much more peaceful affair. For many it was a day for a more relaxed pace of life. A lie in, a delicious breakfast of leftover soup, trifle and after-eight mints (!!) followed by a stroll to some of the less demanding local bumps. 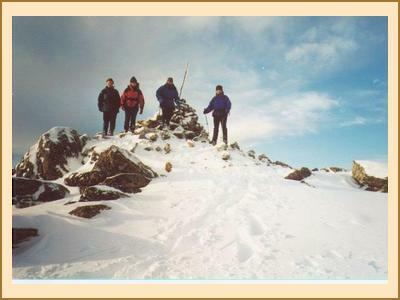 There was also an outing to Creag Pitridh by Ann, Richard and Hywel, and of course, David (now recovered from cold), Fiona and Alastair did some scary climb or other. January 2nd was another fantastic day. Although quite a few had gone home, a determined gang set off to do a "short day" Corbett (heard that one before) down Glen Roy. After a few miles, however, the road proved impassable and with spinning wheels and memories of Bill Brown's epic in the ditch, we turned round. As time was marching on it was a case of "what do we do now"? 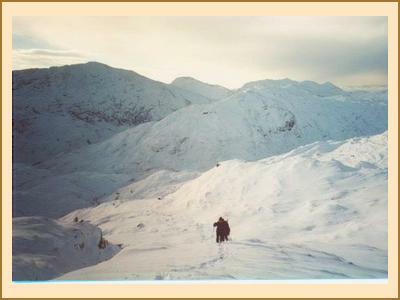 A small gang went on and climbed the Pap of Glencoe in very icy conditions with the rest heading for home. It was a good New Year with some of the best winter weather ever.